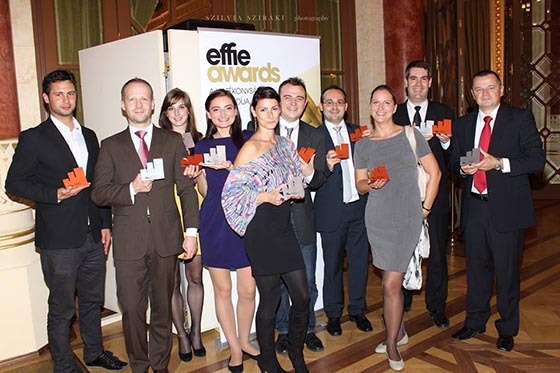 It was a lively celebration at this year’s Effie Awards Hungary Gala, which was held on the 9th of October. There were 51 trophies awarded at the event. 14 Gold, 15 Silver, and 21 Bronze Effies were awarded to successful campaigns that have proven effectiveness. The winning efforts of the 2015 Effie Hungary program ran between January 1, 2014 and May 31, 2015. This year’s Grand Effie was awarded to Soproni, ACG, and Uniomedia for "Soproni - Good Deed." ACG, the lead agency behind the Grand-winning effort, was also the most successful agency in this years competition. Altogether, they walked away with 10 Gold, 4 Silver, and 4 Bronze Effie Awards. Other agencies that fared well in this year’s program include OMD Hungary, who was credited on 8 Effie-winning efforts, and Y&R Budapest, who was credited on 7 Effie-winning efforts.